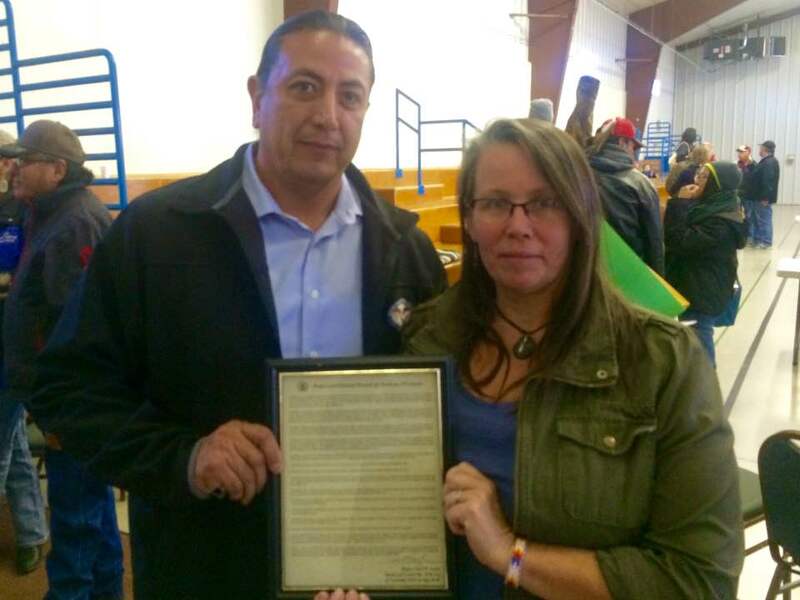 Delivering the City of Madison resolution expressing solidarity with Indigenous Resistance to the Dakota Access Pipeline to Standing Rock Tribal Chairman David Archambault II after a 6-hour Tribal Council meeting. A few days ago, I received an email from a First Nation’s woman, a member of the Hunkpapa and Mnicoujou bands of the Lakota. She had heard I had been arrested at Standing Rock, and was writing to send me prayers and beg for help. With her permission I am publishing the emails and the photos she forwarded of the Dakota Access Pipeline workers (DAPL) who have set up their own camp, complete with barbed wire and police protection. She mentions that members of the Standing Rock Sioux took a walk on October 21 with various members of the Army Corp of Engineers, elected officials, archeological officers, and others, pointing out the sacred sites in this area. She is concerned that the same thing that happened on September 3 will happen again—that once DAPL is made aware of just where the sacred sites are, they will deliberately destroy them. This morning, at approximately 8 AM central, water protectors took back unceded territory affirmed in the 1851 Treaty of Ft. Laramie as sovereign land under the control of the Oceti Sakowin, erecting a frontline camp of several structures and tipis on Dakota Access property, just east of ND state highway 1806. This new established camp is 2.5 miles north of the Cannon Ball River, directly on the proposed path of the Dakota Access Pipeline (DAPL). This site is directly across the road from where DAPL security dogs attacked water protectors on September 3rd. In the emails, my friend is asking us all to do whatever we can, right now, to stand up and demand this corporate control of the government and law enforcement in North Dakota be stopped and humans rights be respected. At the end of the post are phone numbers you can call and demand that President Obama, the Department of Justice, and the Army Corp of Engineers intercede in this human rights crisis, prevent the destruction of the Standing Rock Sioux sacred sites, and shut down the Dakota Access Pipeline now. We are also urging everyone to call their Representatives and Senators and demand that they sign on to Bernie Sander’s letter demanding the President shut down the pipeline. I hope this email finds you well and fully recovered from your traumatic experience in North Dakota. I come from the Hunkpapa and Mnicoujou bands of the Lakota. I am writing this letter to you as a plea for help. You came to our homelands and witnessed my people and our guests pray that those who are the powers that be will see the horror of their ways. On October 2o, a man on Facebook who goes by the name of Cempoalli Twenny uploaded photos of DAPL workers on Highway 6. These workers are surrounded by barbed wire fencing and the work site has flood lights. Please see attached photos. On October 21, Don Grey Day and Courtney Yellow Fat drove to Mandan, when they reached the Fort Rice rest area they video taped a new blockade with what appears to also contain a camp with police, screenshots also attached. The video is viewable via FaceBook search for Don Grey Day. The area that the group walked in is the site of the September 3rd dog attacks on the Water Protectors. The site of the dog attacks is the PREVIOUS area Tim Mentz had identified as holding sacred sites on September 2nd. The following day DAPL chose to rip that area up. Also posted on October 21 by Jeff McLaughlin Sr., a local tribal member, was a post informing tribal members of DAPL workers seen within 5 miles of the dog attack site. I am writing all of this to you because we are at a loss of whom to turn to, because the people we would normally go to are the very ones who seem to be at war with us. I am hoping that somehow you can take all of this information and reach out to the proper authorities who can handle this situation. Or at the very least make it public. With your permission I would like to ask to include you in our prayers to help you with your healing process. I am deeply sorry that you had to experience what you have in ND, but it is my belief that Creator chose this for you so that you could experience and witness the injustices that have been happening against the Water Protectors. 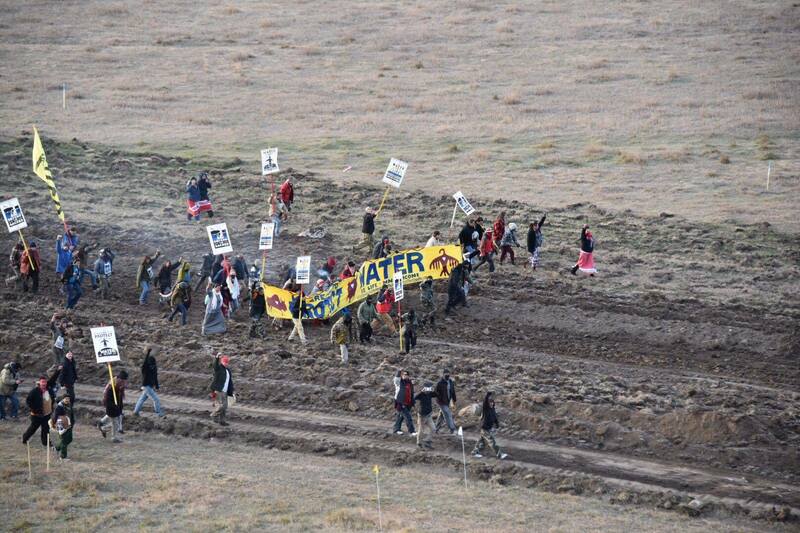 For months the Morton County PD has denied any wrongdoings towards the Water Protectors. Please share the photos with as many news sources as possible and with who you feel will help get this information to the world. For reasons unknown to me, a lot of people are not seeing the posted articles until hours later, and sometimes not even until they get tagged in posted articles. I pray that Water Protectors across the globe win our fight. Water is our source of life, from the moment we are conceived we grow inside our mother’s womb inside water. Without water we die. This is a vital source of life that must be protected. On a personal note I am a clean water supporter because uranium-tainted water caused me to be born disabled. My mother lived in Rock Creek, SD (also known as Bullhead) which a small town on the Southwest corner of Standing Rock Sioux Tribe. My mother drank the local water while I was in utero and when I was born I was born with most of my fingers missing. There were several of us born with varying disabilities that year. Over the years there were animals found with extra limbs, missing limbs, and other disfigurements. Rock Creek has the highest rates of cancer and miscarriages. I myself have suffered multiple miscarriages, and I feel that I am extremely blessed by the 3 I do have. The uranium mines remained unmarked until the late 1990’s. Standing Rock Sioux Tribe also started piping in clean water for Rock Creek’s residents. You can google Rock Creek + Black Hills Defenders for more information. And if you like I can send photos of my hands. Again thank you for your time, prayers and attention to our cause. Call Cecilia Muñoz ( 202-456-1191) who is is the President’s Domestic Policy Advisor and the Director of the Domestic Policy Council. Established by Executive Order in 1993, the Domestic Policy Council (DPC) coordinates the domestic policy-making process in the White House, ensures that domestic policy decisions and programs are consistent with the President’s stated goals, and monitors implementation of the President’s domestic policy agenda. Cecilia Muñoz: 202-456-1191.
you can often write comments after a story, these are DAPL stories.